Using your PC to store your photos, videos, and music might save you the trouble of having to dust off photo albums and alphabetize your CD collection, but it can still be a pain to keep your media converted, stored, tagged, and uploaded. Here's how to automatically download, convert, and sync your video files, dump your photos to Flickr, and take the pain out of tagging your music library. Built-in Webcams, phone cameras, pocket camcorders, HD video on point-and-shoot cameras--you can take a video with pretty much any gadget lying within arm's reach. However, depending on what you plan on doing with those videos, you'll need to convert them into different formats, which can be a fairly time-consuming task for your PC. Videora Converter can handle your basic video conversion needs. If you just need to convert a folder of videos into a certain format (to play on your iPod Touch, for example), Videora iPod Converter can do this basic task. 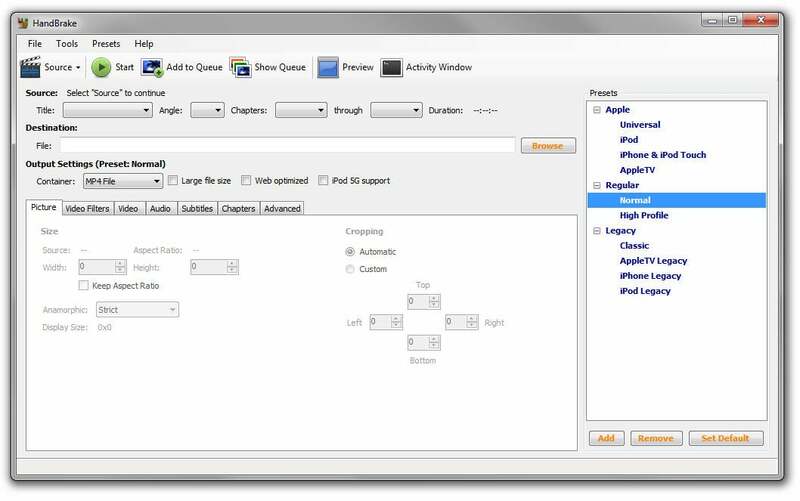 Select the setting recommended for your device, play around with the quality sliders as you see fit, and click the One-Click Convert button at the bottom-right of the screen to bring up a dialog box that will let you drag to select as many files as you want. Unfortunately, some of Videora Converter's more advanced features don't work well. While it's possible to tell Videora to watch a certain directory for new files, automatically convert them, and add them to iTunes, I couldn't get the directory-watching to work at all, and the iTunes-adding seemed to work infrequently. Handbrake's GUI app. We won't be using this. I wanted my PC to find the new videos, convert them, and sync them to my iPod Touch without requiring me to do anything, which meant I needed to switch tools. Instead of Videora, I opted to use Handbrake, another popular video conversion app. Handbrake doesn't make it easy to set up an automatic batch conversion from the graphical user interface (you have to manually add each item), but it does include a separate command-line app that we can work with. Dust off your DOS skills, ladies and gentlemen--we're going to write a quick batch file (.bat) that will tell our PC to take all the files in the immediate folder (or any nested folders), pass them off to Handbrake to convert into an iPod-friendly format, name them ("filename-ipod.mp4"), and then hand them off to iTunes, which will add them to the iTunes library and sync with my attached iPod.